CONCORD – Greta Thunberg, 16, gave them hell in Davos. 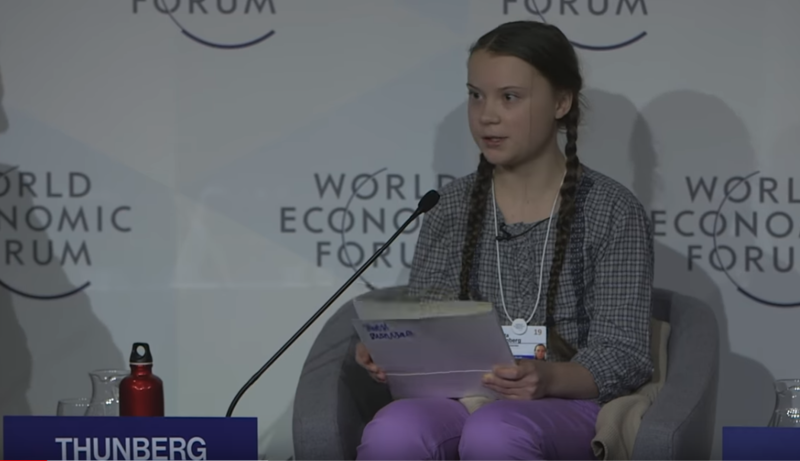 Addressing an audience at the annual World Economic Forum in Switzerland the other day, the Swedish teenager complained about the laconic response of her planetary elders to the climate crisis. That gave me an idea. What if teenagers started intervening in proceedings before the Public Utilities Commission (PUC)? ‘Intervention’ is used here in its legal rather than its colloquial sense. A family might stage an intervention to force an errant loved one to confront his drinking problem or even his bad breath. But under the New Hampshire Administrative Procedure Act, which governs most cases at the PUC, “intervention” refers to the process of becoming a full-blown party. The PUC always allows members of the public to file comments on its cases, or even to make the orally at hearings. But intervenors – actual parties – have the right to submit testimony, to conduct discovery (i.e., force other parties to disgorge information), to do cross-examination at hearing, and to participate in settlement negotiations. Why would teenagers want to do that at the PUC? Because if Greta Thunberg is correct, and the house really is on fire, the PUC has as much authority as anyone in New Hampshire to try to put the blaze out. For example, this spring, two of the state’s four electric utilities – Eversource and Liberty – plan to file rate cases at the PUC. What does a rate case – a proceeding in which a utility asks for permission to raise its prices – have to do with climate change? The answer: a lot. Should rates change over the course of a day or a year so that electricity becomes more expensive when demand soars and more carbon-emitting generators must be pressed into service? Should we be structuring electric service so as to encourage people to drive electric cars and forego carbon-belching combustion engines? Likewise, should we encourage switching from oil furnaces to highly efficient electric heat pumps? Should we force our electric utilities further into the background, making them mere “platform providers” so that scrappy, unregulated companies can provide innovative services to customers who want to rely on locally produced renewable energy? Should we expect utility shareholders to invest their money in energy efficiency, on the theory that ‘negawatts’ are both cheaper and more environmentally benign than megawatts? In addition to the electric rate cases, there are some natural gas dockets where the teenager perspective would be informative. The two teenagers I’m raising might well ask: Why don’t you do it, Dad? As the head of the Office of the Consumer Advocate (OCA), aren’t you supposed to be out there fighting for the ratepayers at the PUC? My answer is that the ratepayers and the planet are not necessarily the same constituency. At the OCA, our focus is on keeping rates low, service reliable, and customers as empowered as possible (by allowing them, for example, to produce their own electricity and even export some of it to the grid for money). We don’t thwart efforts to address climate change, especially when they are cost-effective, but neither do we promote them. As a regular participant in PUC proceedings, I take the process very seriously. Efforts by activists to turn PUC hearings into a kind of theater, for publicity purposes, are nothing I would ever encourage. On the other hand, when activists expend the time and effort to participate meaningfully, by developing and presenting evidence, and by challenging the evidence of others, they become formidable. I’ve seen it happen. Last March, the PUC ruled that it will not take “environmental policy” into account when making decisions. Who better to contest that legal conclusion, before the New Hampshire Supreme Court if necessary, than the teenagers of the Granite State, who must live in whatever environment we leave them? Grown-ups are routinely admitted to PUC proceedings as intervenors if they indicate they are customers of the affected utilities. For essentially the same reasons that Greta Thunberg told the folks in Davos that “our house is on fire,” I think teenagers can assert a substantial interest within the meaning of the statute even if their names do not appear on utility bills. The Administrative Procedure Act does not say you have to be an adult to intervene. Moxie was required for Greta Thunberg to go to Davos, and moxie would likewise be necessary for teenagers to participate meaningfully in PUC proceedings. But the OCA would be there to help. The clinics at the law schools in Concord and, especially, nearby South Royalton, Vermont (which specializes in energy) could be pressed into service. Surely there’s a daring high school teacher out there who would like to roll out such an opportunity for her students. In Vermont, a big player in utility proceedings is the AARP – the American Association of Retired Persons. But the utility customers the AARP represents are senior citizens. Young people have an even bigger stake in public utility cases than the elderly do. So getting high schoolers involved in PUC proceedings would be another chance for New Hampshire to leapfrog over Vermont while advancing the cause so nobly stated by Greta Thunberg in Davos. As Greta Thunberg said, I don’t want you to be hopeful. I want you to act.